Unlike other yachts, where a blind person would be troubled by obstacles and inclined decks, the roomy and open design of the Atoll makes for a perfect environment for them. The unique design on our yachts insures easy boarding and comfort once aboard!! These yachts don't incline while underway and our daily sailing time does not exceed 3 to 4 hours. The yachts are comfortable and spacious with large open areas and lots of large storage spaces. 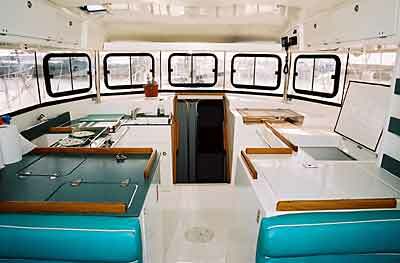 The cockpit- living room, kitchen area, refrigerators, and chart table are all open and on the same level. As a result, movement is easy, comfortable and above all safe. The extra-wide boarding ramp makes access easy and safe and can also be used swimming platform to get into and out of the sea. A blind person will be able to enjoy the holiday of a lifetime with friends or family. The fact that we have fitted our yachts for handicapped persons will be an asset as well since a lot of the equipment will make their stay even more enjoyable. a full time captain/guide-hostess who will guide you around the islands of the Saronic and Argolic gulf. supplied on board during the whole weeks charter, breakfast (continental), midday lunch (including light salads and sandwiches), sodas, snacks, fruits, refreshments (non alcoholic beverages), etc. visits to all archaeological and historical monuments. fuel for the yacht, for the whole week, water and ice. all linens, towels and blankets. free use of all yachts equipment. Greek VAT taxes, Port dues, Marina fees, insurance. Cleaning fee at the end of the charter. meeting and transportation from the airport to the yacht.